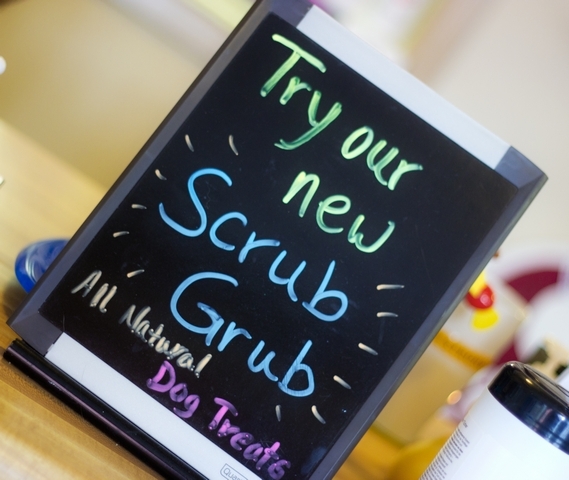 Top off your dog's day at the spa with some delicious Scrub Grub! These all-natural treats are dog-tested and dog-approved to be wholesome and tasty. Even if it's not bath day, stop in and grab some Grub to show your dog how much you love him! The Canine Scrub currently offers three Scrub Grub flavors, listed below. Ingredients: molasses, honey, water, olive oil, whole wheat flour, baking soda, cinnamon, ground cloves, ginger. Ingredients: white flour, corn meal, chicken broth, butter, egg. Ingredients: rye flour, corn meal, milk, butter, parsley.